This MONORAIL TYPE TEMPERING OVEN is specifically designed to continuously heat-treat automotive parts at a rate of 1,000 lbs. per hour. Utilizing unique FECO supply nozzle engineering, this 600° oven processes 80 parts per hour. Custom tailored to our customers process needs, this system was sold complete, including the ambient air cooler, monorail track, supports, chain, fixtures, and variable speed monorail drive. 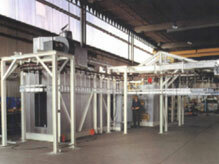 The overall dimensions of this system are 51 feet long X 21 feet wide X 13 feet high.